River Oaks’ 2 & 3 Bedroom fully furnished & professionally decorated golf villas are nestled in a hidden enclave, these vacation villas offer tennis, swimming pools, & acres of beautiful wooded landscape ideal for biking or leisurely walks. Here you can relax on your private screened porch & enjoy the views of rolling greens & fairways of River Oaks 27 Hole Championship Golf Course. 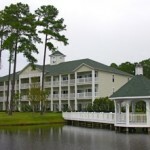 Centrally located to many of Myrtle Beach’s top golf courses and within minutes of some of Myrtle Beach restaurants and night spots.